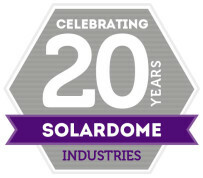 In celebration of our 20 years in the design and manufacture of geodesic domes, we’d like to give you a special offer. If you place an order for your new glass dome by 31 October 2016 we’ll give you a free upgrade to a coloured dome – choose from grey, coco brown or grass green. If you cannot wait for your brochure to arrive, you can view it online by clicking here.